SCARRED SURFACE The moon held on to almost all the craters it's ever acquired in 4.5 billion years of impacts. 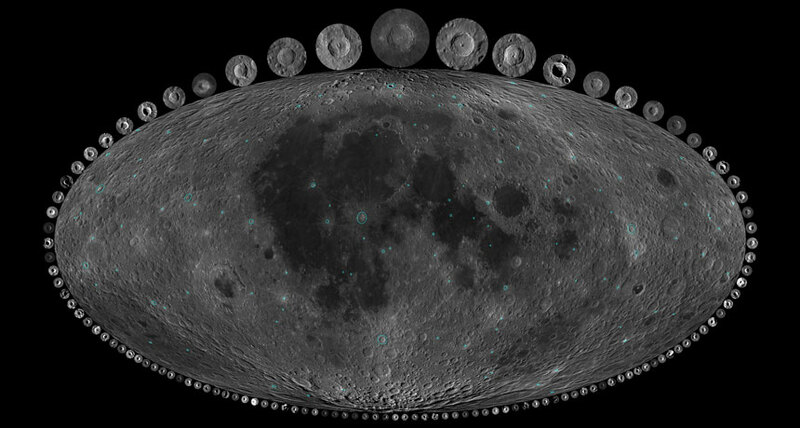 This lunar map is surrounded by images of 111 craters wider than 10 kilometers and younger than a billion years. A new look at the moon's craters suggests the Earth and moon both suffered a sharp increase in impacts around 290 million years ago, and Earth has kept its biggest scars. Geologists long assumed that erosion and tectonic activity had erased Earth's craters so thoroughly that "you couldn't say anything about the craters on Earth at all," says planetary scientist Rebecca Ghent . So to figure out how much Earth was pummeled in the past, Ghent and her colleagues turned to the moon. "We can use our closest neighbor to learn a lot more about the Earth's history," says planetary scientist Sara Mazrouei, who worked on the study as a graduate student under Ghent at the University of Toronto. With no atmosphere and no plate tectonics, the moon's surface preserves a record of nearly all of its 4.5 billion years of craters. If the moon sat through a hailstorm of impacts, Earth should have experienced the same storm, and therefore the same rate of cratering, the researchers argue in the Jan. 18 Science. But without knowing how old most lunar craters are, it's unclear if the Earth and the moon suffered impacts constantly or in short bursts. Ghent realized in 2014 that the youngest craters on the moon were surrounded by large rocks, debris excavated by the impact that formed the crater . Those large rocks absorb heat from the sun during the lunar day and radiate it back out at night in wavelengths of light visible to NASA's Lunar Reconnaissance Orbiter. "Right away you could see the young craters popping out," Ghent says. Older craters, by contrast, were surrounded by rocks that had been beaten down to dust over time, so they didn't glow as brightly at night. Ghent used nine craters whose ages were already known to figure out a mathematical relationship between a crater's nighttime glow and its age. Then Mazrouei, working by hand, mapped all 111 lunar craters less than a billion years old and wider than 10 kilometers in diameter, and used that map to figure out the cratering rate.